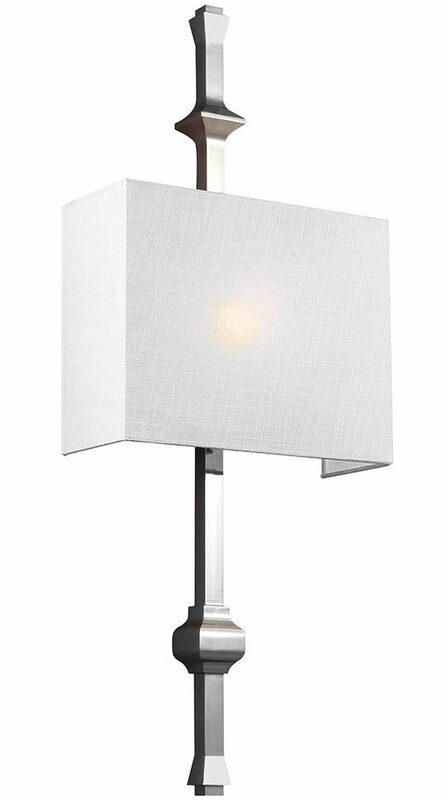 This Feiss Teva 1 lamp wall light in polished nickel with white Shantung shade boast transitional elegance and clean sleek lines. Tall sculpted wall mount in square section steel, with architectural features and three-sided white Shantung silk fabric shade that diffuses the light beautifully. The bright nickel finish architectural wall mount is inspired by the fluid lines of a vintage scale and paired with a white Shantung silk shade, which create a wall light that looks great in traditional and contemporary rooms alike. It is constructed in steel and also available in antique bronze finish, please see below. This classy light is supplied by Elstead Lighting and designed in the USA by Feiss, founded in New York in 1955. They have become well known over the years for their contemporary yet classic styling, quality and great original designs like the Teva 1 lamp wall light in polished nickel with white Shantung shade you see here.